Well, found my way to the new forum. Definitely take some getting used to. Still working on our plans for our first trip with our first trailer. Won't be till April, but we are really looking forward to it. As we have not had our trailer out yet we are trying to soak up as much info as possible so we can get everything together before we leave. Should be great though, and will definitely share our thoughts on the new trailer. Well, you can always driveyway camp to break in the appliances and such! My DW thinks I'm nuts, because I will tell her I'm going camping today and she looks out at the weather and says I know you are not going any where. I'll tell her no I'm just going out to the 5er. I'll go and turn on the radio or put a CD in and rearrange closets or clean something or just sit there and get a break from the house (and spongebob). We both did that when we first got it to familiarize ourselves with the unit. Its good for mental health, ya know!! We don't have the space to driveway camp. The trailer is at a storage place on the other side of town, and with 4 vehicles at the house (Both my trucks in front of the garage) it just is not an option. 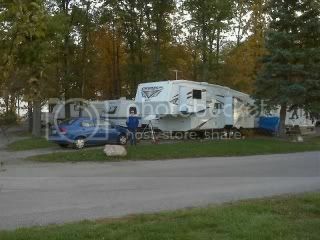 We really wanted to spend at least a couple nights in it when we picked it up, but too cold and too busy. So our first experiences are going to be hundreds of miles from home. Hopefully nothing slipped through the PDI!!! We too do not have a driveway with enough room to driveway camp. Besides I think the Seville is larger than our townhouse, and the neighbor's added together. We to are dreaming of our first outing with unit hoping all appliances work properly coming out of VERY COLD storage. We have been gathering things to put in our Seville, outfitting it for projected usage. When it warms up I will be very busy installing &amp; testing all equipment. Truck is almost ready to go, needs 4 new tires on rear axle, 91 gallon fuel tank re-installed in bed, a good bath inside and out, and hitch on front modified to hold my KTM 530 EXC-R.
Our first major trip will be to Alliance Nebraska for a 1000 yard target shoot sponsored by the FCSA (Target rifle, ammo, and supplies sent back home with another competitor, to avoid transporting rifle into National and State parks. ), then to Hill City, SD for camping until next weekend, then to an offroad motorcycle event in Upton WY, then to SW MT for camping and day trips into Yellostone, then the next weekend to Cascade MT for another National Enduro, then back home. Weekend trips prior to June will allow us to fine-tune the major errors of our planning. I'm really getting into the idea of camping with our Seville - who needs a job anyway - it requires too much time that could be spent camping! I can definitely relate to that, i have a garage big enough to garage camp i cant wait!! !